There is no doubt that I have gained more from going through Buth’s first book than I have from any other resource. I am not surprised by this evaluation. I have helped organize two fluency workshops for professors of New Testament Greek that were run by the Biblical Language Center (and am planning another this coming summer). 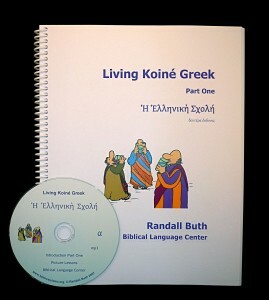 Not uncommon on the evaluation forms is that participants lament that we did not emphasize enough that they needed to work through Living Koine Greek Introduction Part One and other audio materials the BLC puts out. Note that these are professors of New Testament Greek who are making such comments. So if professors find it useful, how much more would a beginning student?